And the appliqued flowers are gorgeous too. Ahhhh! the chickens have their heads now! LOL. Do you feel like you lost yours? The piece is coming along beautifully! I still love those colors! 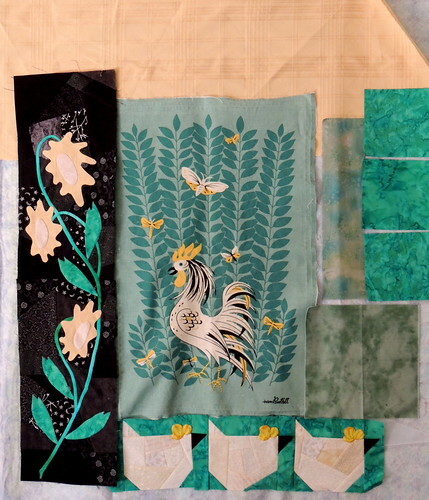 I love your applique and how this quilt it coming together. Looking forward to watching this progress. Those flowers and the elegant leaves are gorgeous. The appliqué sunflowers were from an old "easy appliqué" book--I changed the stems and added the leaves to make them look a bit more like the sunflower volunteers along the walk outside my studio. I'm loving this one. Can't wait to see more.